I’ve had a bit of a lucky streak recently. First, the lovely people at Majestic chose my Question for their monthly Wine 999 feature, winning me a lovely mixed case (worthy of its own post – stay tuned!). And then I also got given this bottle of white, which went straight in my fridge to be enjoyed as soon as the sun made an appearance on a late summer evening. Now it’s not one I’d probably have picked out myself, but if you’re after a fresh, zingy, tasty and affordable white, the Torres Vina Sol a pretty safe bet. It’s a Spanish white, reminiscent of a crisp NZ Sauvignon Blanc or Sancerre. Along with fresh citrus on the nose, there are subtle fruity flavours that round it off nicely. Serve slightly colder that you normally would for a white – proper fridge temperature benefitted the tangy nature. Definitely drinkable on it’s own, it’s also a good choice with the classic seafood / rice / fish options. Good news – it’s widely available from shops including Tesco, Sainsburys and Majestic. And it’s easy on the wallet too – coming in at under a fiver if you pick the right offer. A little while back, this article revealed just how successful a certain cheap bottle of red had been. With accolades from newspapers, buyers and the Decanter World Wine Awards, it seems like a pretty sure bet for a tasty, good value red. But does it live up to expectations? Short answer: yes, for the price. You can pick this up from Asda (or Walmart in the States) for around £6, and any wine this smooth and flavoursome for that price is a pretty rare find. It’s certainly not a heavy red, but you do know you’re drinking a Malbec. It’s more fruity than smoky – think blackberries and cream. Smooth and juicy is how one person described it, and that sums it up really. The problem though, if you’re looking for one, is it’s a bit… well, nondescript, I guess. Personally I like to enjoy a glass of Malbec with steak, and it has to be big, bold, punchy and flavoursome to hold up to that. This one certainly isn’t – with it’s smoothness and lightness it would work better with tomato-based dishes, picnics, cheeses and cold meats. Overall? A good summery red and a steal at £6. Yes, I’ve got an admission to make. I *might* have drunk this whole bottle of delicious, zingy Italian white before thinking to take a picture of it while there was still any left. I guess that’s the problem when a white knocks your socks off after a rather hard day at work. Now I freely admit I don’t know much about Italian wines full stop, and I actually got this bottle as part of a mixed case, rather than deliberately choosing it. To me, none of the words on the label really meant much, so I thought I’d give it a go with a pasta dish and see what happened. Think of the crisp mouthwatering flavour of a really good NZ sauvignon blanc, add in a decent whack of unoaked French chardonnay, and then imagine a twist of a lovely citrusy Viognier and you should be getting close to the flavours this white from the Veneto region offers. I loved that fact it’s light, but got enough punch to hold its own against the chilli and crab in my pasta dish, as well as being infinitely drinkable all on its own. Sadly, this particular bottle from Naked Wines is now out of stock (don’t worry, I’m petitioning for more!) but in the meantime I’m going to be trying this bottle from Majestic Wine, which comes from the same region. And I’m definitely keen to try out some more Italian wines. If you’ve got any suggestions where to start, I’m always open to ideas! Back in July I spent a glorious 2 weeks in Cape Cod, and tried some amazing wines. In a lovely little shop on Martha’s Vineyard we came across a great selection of French wines, including this Chardonnay. It was so good, I brought it all the way home in my suitcase, and thankfully it survived! And boy was it worth the effort. Crisp, fresh fruit with a balance of minerality, this is a classic Chablis. Now I’m a big fan of oaked chardonnay too, but this wine, which saw only stainless steel tanks when it was made, maintains a lovely rounded flavour. I love the complexity in good white Burgundys – this has a great balance of citrus flavours, hints of grapefruit and then a tang at the back of your tongue. The perfect accompaniment to seafood or nibbles at the start of your meal. If you like good NZ Marlborough sauvignon blanc, I’d take a guess you’ll like this too. Chablis 2014 Domaine Servin, Majestic Wine. £11.24 (on offer). La Maladiere, 2013 William Fevre Chablis, Majestic Wine. £13.99. Admittedly, I’ve had some bad experiences with cheap rosé, which have made me a bit wary. But re cently out for a lovely 3-course dinner in which we ate everything from ham hock tortellini to lamb to fresh sumptuous cod, it was going to be difficult to match wine to all the food without spending a LOT of money. The solution was this fresh and tasty Pinot Grigio blush. Light, fresh, tasty, but with a roundness and depth that lots of rosé’s can miss. It honestly went really well with every course we had. Along with Prosecco, rosé is enjoying something of a revival, and gradually shaking off its image as a girly drink for glittery nights out. Provence is producing some fantastic options, with the climate and soil producing lovely flavour, and a pale wash of colour rather than a bold brash red-pink. The Sacchetto rosé we enjoyed was smooth, fresh and zingy. Think berries, apples and even a dash of cream. So give it a go, embrace the pink and shrug off any preconceptions. And remember to tweet @WineBlag with any good discoveries! You can buy the Saccetto Pinot Grigio Blush here. Or try this from Waitrose, or this bottle from Provence, supplied by Majestic. I credit my lovely Dad for introducing me to the wonderful world of wine, so it was a very easy decision to decide where to take him for his birthday. The Fulham Wine Rooms are the sister restaurant to The Kensington Wine Rooms, which I’ve written about before, and boy are they good. H ere’s the concept. 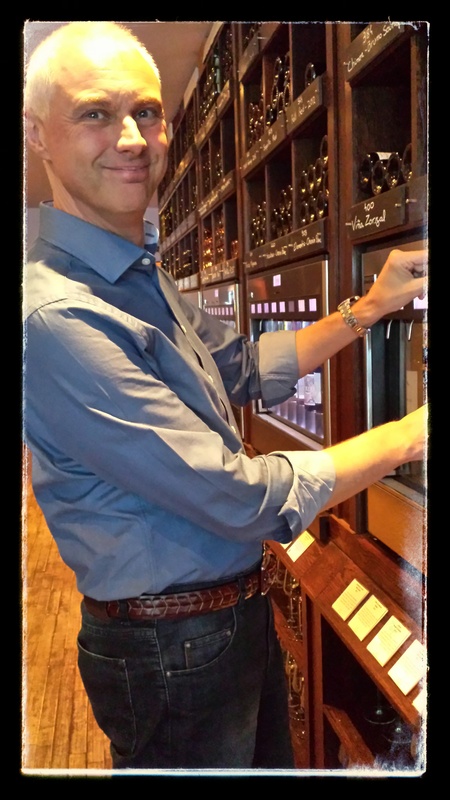 A great selection of wines – and a cash card you can load up allowing you to taste at your own pace and your own amount. The price for a small 25cl taster of the wines ranges from as little as 70p up to around £2 for the really good ones. £15 on each card got us around 15 wines to taste between us. Each wine has a handy little explainer card below, too, giving you an idea of what you might taste. << Dobogo Furmint Tokaji (2012). This Hungarian white is made in the same region and from the same grapes as traditional dessert wine, but is actually very dry and very, very good. Think honeysuckle, apricots, warm and complexity. >> SP 68 Bianco, Sicily (2013). The Wine Rooms had a good selection of natural wines, made with minimum chemical interventions or additives. This white was incredibly clean and fresh, disappearing from the palate almost instantly. With pleasant fruity flavours and a crisp taste, the lack of sulphates should mean less chance of a hangover too. Winner. << Puligby-Montrachet ‘Les Enseigneres’ Domaine Chavy-Choet (2013). Simply wow. A stunning white burgundy, it was full and rich and had a beautiful taste of honey. Expensive, retailing at around £35 a bottle, but I think I’ll be saving up my pennies to treat myself. >> Ballon, ROT Wine Rooms Production, Cotes-du-Rhone (2013). Boo, the only wine that disappointed. I really *wanted* to like this red, blended by the Wine Rooms and another natural wine. But to me it smelt of feet, and tasted a little of vinegar. << Rioja Crianza Bodegas Amezola (2010) / Rioja Reserva Especial, Urbina (1998). Although not a strict comparison, tasting these 2 riojas together was really useful to compare how age changed them. The Crianza was younger and would be perfect in another 5 years or so. The Reserva – aged to perfection – was full bodied, smooth and tasted similar to Port. 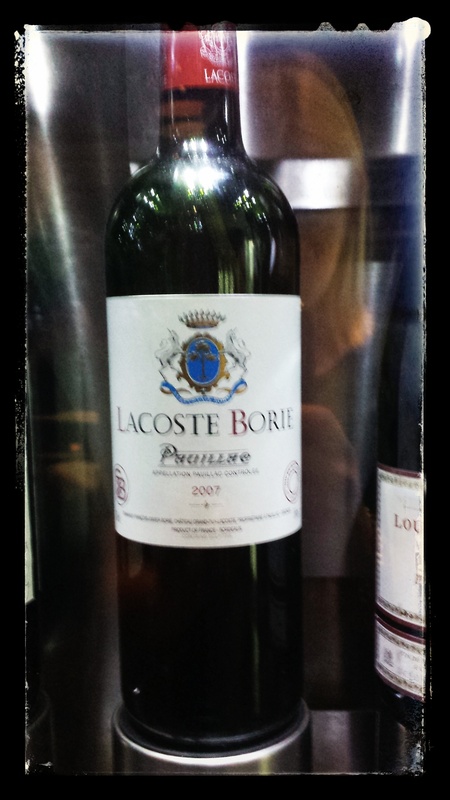 >> Lacoste Borie, Chateau Grand-Puy-Lacoste, Pauillac, Bordeaux (2007). My favourite of the whole evening (and that’s saying something!). This Pauillac was smooth, but with big flavour and an amazing nose. A real treat – at £63 a bottle it’s not normally one I would be able to try! You can see more information about the wines above here. Don’t forget you can always tweet @wineblag for more information. English wine. As I’ve said before, I’m not usually a big fan. Given the choice b etween an English bottle or a French, I’m afraid my patriotism goes out of the window and I’d pick the French every time. In most areas of the UK, our climate simply isn’t conducive to producing the grapes suitable for making lovely, high quality wine. But there are a number of vineyards dotting the south coast of England, trying valiantly to convert sceptical people like me. Hush Heath Estate is one such vineyard. When we moved into our new flat recently, a pack of 3 bottles from here had been left for us. One was a tasty cider which disappeared very quickly indeed! I needed more convincing about the other two though – an English chardonnay and an English pinot noir. The pinot, as you can see, was a very light ruby red, and at only 11% alcohol content, tasted pretty light too. On their website, Hush Heath suggest this wine is a good accompaniment to game – I’d disagree. There wan’t really much to it at all – no fruity flavours to roll around your tastebuds, nor oaky depth to savour as you drink. You could almost say it was more like ribena than red wine. Although Pinot Noir is typically a lighter red, good bottles have complex flavours and depth to them that I’m afraid this English offering was lacking. On the positive side, if you wanted a red to go with meaty fish like swordfish, or salmon and not overpower it, this could work well. I’m still to be convinced that us Brits can produce good wine that can truly rival more traditional producers. Sorry Hush Heath, at £22 a bottle this Pinot Noir just didn’t do enough.